OK, I confess that I'm trying to find something interesting to talk about. But, this is what I did today, and it brought me a lot of satisfaction, but it's not too picturesque. Ellen and I hiked about 7-8 miles total (we had to go both directions). We had planned to get together, and after the mess I encountered yesterday, I thought I should hike some more of the section I maintain. We didn't find anything as bad as that maple tree you saw yesterday. This was the messiest. You can see my car behind it. We drove into the trail crossing, about one mile from a seasonal dirt road, on a two-track. It's very narrow, but I know it pretty well, and it gets me to the center of my section. This picture doesn't look like much, but it has an interesting story. This used to be the kind of thick, mature oak and pine woods that you see so much of in my trail pictures. But in 2006 there was another one of those bad wind storms. That one had several events that are called microbursts. They are small downdrafts of air that are moving about 150 mph, and they will lay down small areas of trees, flat... just like pick-up sticks. 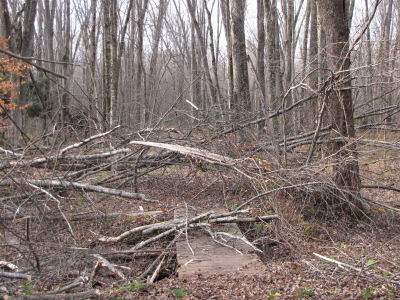 The Forest Service authorized some salvage harvesting, so the big trunks were taken out and sold. It looked pretty awful until last year. Now it's starting to look less raw. 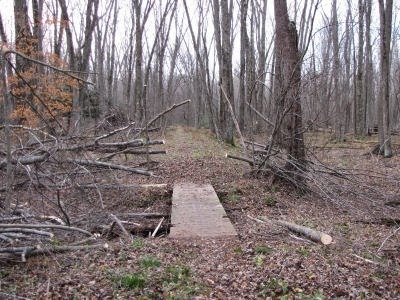 It actually makes an interesting opening in the usually dense forest. The temperatures have dropped into the low 50s, but that makes it quite comfortable to do trail work. It sprinkled off and on, but at one time, I looked up, and there was beautiful blue sky! 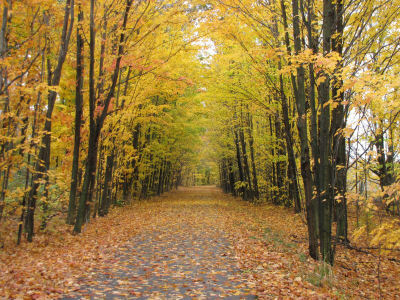 I thought I would go check some of the portion of North Country Trail that I maintain, this afternoon. My plan was to walk a 3-mile section. The blazes need re-painting, but I wasn't really up for that. 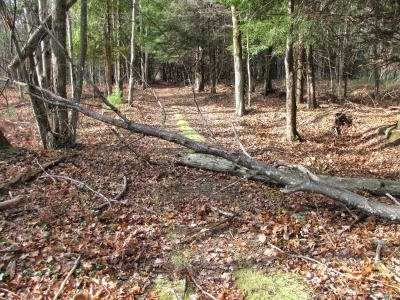 I thought I'd just check for damage from the windstorm and flip dead stuff off the pathway. I was only a few hundred yards into the section when I encountered this. OK, no problem. I pulled out my 24" bow saw, and got rid of this problem without too much trouble. Just a little bit farther on I found another similar tree, but it was a little bigger. OK, I was able to cut that one out too, but it was about as large as I could do with the saw I had. The piece I had to roll out of the trail was pretty heavy too... oak. 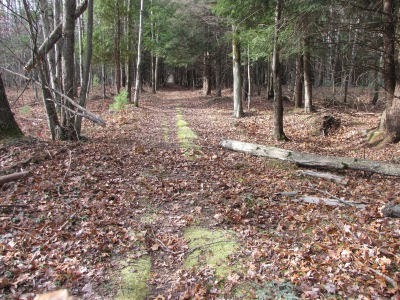 This section of trail follows an old railroad bed (can you tell? ), and there are five little bridges. When I reached the second one... uh oh! I forgot to take a picture of what it looked like at first. A huge maple tree had fallen, and the top was spread across this bridge. I took this picture when I had already cleared half of it. It took me 90 minutes just to cut out all of this tree top. Maggie couldn't figure out why we were staying in one place. She doesn't like doing trail work very much. She'd rather walk. So, all the walking we did was a half-mile, to the end of the rail grade and then back to the car. I wonder how bad the rest of my section is. I'll have to try to get back there this week. Share 7 things about yourself. Pass the award to other bloggers who you think deserve it. I'll try to pick four again... I'm trying to pick blogs that are diverse, in keeping with the award. Be sure to let the bloggers know you chose them to receive the award. I'm going to put my four recipients first, and then proceed to the second part of this post. Recipient 1: Folk Art by Campbell Jane. I've recently discovered her blog, and she creates interesting paintings, crafts, prints, etc. I like her style. Recipient 3: Sandra, of My Mother Thinks I'm a Good Writer. She writes poems, children's stories, essays and more. Recipient 4: Juila. She's been really busy lately, but perhaps she'll get back son to telling us more about Our Simple Life. 1. I am REALLY struggling with doing this award again so soon. 3. I don't like those new teeth you all watched me get last year. 4. I'll be SO glad when the election is over, and the nasty ads go away. 5. I like yellow and blue. 6. I'm writing a story for this month's Accentuate contest called Doru's Birthday- the theme is Hope (it's due Sunday night). 7. I like submarine stories. Since this windstorm of the past three days was supposed to be really serious, I decided to document some of it, in my kingdom. This was predicted to be as bad as the 1998 storm which did a lot of local damage. 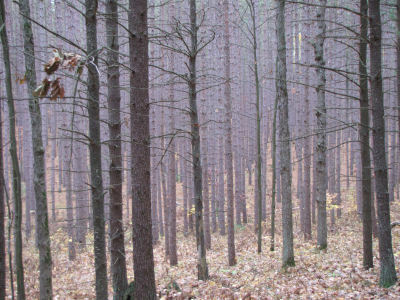 It flattened whole valleys full of trees at Ludington State Park. See Two Lighthouses and a Trail, for a picture of how that area is beginning to re-grow. It broke my big basswood (18-inch diameter) right off at the base. That storm also rolled a small travel trailer I owned, in the driveway! So, with the predictions I was thinking we might lose a tree or two... not something that makes me happy. The end result wasn't too bad right here (no broken trees). At Big Sable Point, also see the linked post above, they recorded gusts of 71 mph. North, at the straights of Mackinac, there were 78 mph winds. Wow. They reported on the news tonight that the barometer dropped so low that it was actually a sub-tropical depression here in the northland. There were a lot of power outages, and downed trees in Michigan, but none right here. So, my documentary doesn't have any horrible happenings. I'm not a bit disappointed! Remember the Big Bluestem, Turkeyfoot Grass? I love it, and it's so very happy in one location in my kingdom that in the fall it's just like a short maze to get through it. Here's Maggie entering the maze from the south on October 7, a nice dry day. Here's Maggie, exiting the maze two days ago when everything was wet. Those colors are really close to how it looked under the different conditions. I just like walking through that section of my trail. The point of this contest is to spread some love around to as many blogs as possible, preferably personal blogs. I'm starting with some blogs by friends, but then, to win, you'll need to go exploring. I'll tell you how. The winner will dethrone Chuck, last month's winner. Unless, of course, he wins again! Entries must be sent to jhy@t-one.net by 11:59 PM (EDT), October 31, 2010. So you have 5 days to work on this. Here's what you need to do. Part A- Visit the following blog posts, find the items that there are three of, and leave a comment. Part B- Find those items on other blogs. Find other blogs with those words/ phrases (doesn’t have to include "three") and leave them a comment that says something about the contest and includes my blog address. Don’t spam... personal blogs are probably better than commercial blogs. Try to stay close to the original meaning of the word/phrase. For example, if the word is boa, and it’s referring to a snake, then don’t comment on a post that’s about a feather boa. If you can’t think of what to say try something like: "Hi- I am playing a blog scavenger hunt, created by sharkbytes at myqualityday.blogspot.com, and I just found a boa on your blog. Thanks!" Here's one way to search other blogs. Load google.com. under "more" choose "Blogs." When the page loads you'll have a search box, but all results will be found on blogs of some sort. If you are getting too many commercial results skip to page 10 or so. Joe, boa, URL1, URL2, etc. To win you must have all 7 items, and have found and commented on at least one blog for each item, in addition to the blog where the item was found. If you want to verify that you have the correct list of items before hunting for other blogs, email me your list and I'll check it. The WINNER will be the person with the most verified comments. In the strange unlikely event that there is a tie in the number of total comments made, the person with the highest quality match to the original post would win. To continue the boa example, if the original post was about a baby boa constrictor, a comment on a post about another baby boa would be worth more than one about a six-foot boa, although both would be fine unless it comes to a tie. If this isn't clear, throw your questions in the comments and I'll try to make the meaning clear. Good luck! These pictures are actually from yesterday. We have three days of predicted bad weather, so yesterday I decided to try to beat the rain, and get in a bike ride. 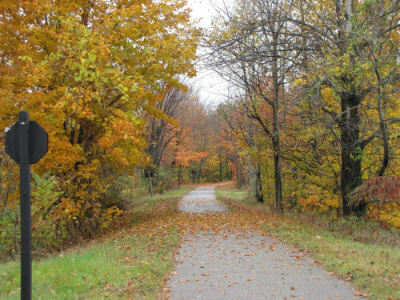 We have a rail-trail, the Hart-Montague Trail, that starts about 30 miles from us. So I loaded up my bike and headed down there. 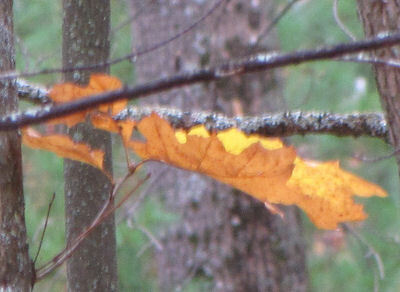 It had rained during the night, and the light was all diffused through clouds, but that often makes leaf colors really intense against trunks which are darkened by being wet. The vibrant colors are gone, but the gold/maroon/brown palette is really rich. This is where the trail starts. There are several places where the trees overhang the trail, but this is one of my favorite, in any season. Today, rain. Tomorrow and Wednesday, we are supposed to get a wind storm as bad as one in 1998 that did a LOT of damage. Money first, just because I'm so "proud." I finally sold a copy of Get Off the Couch with Joan! It's just $2.99, eBook format only, but you can get it in HTML, pdf, or rtf as well as formats that work with the fancy readers. I have NO idea what a typical conversion rate is, but this is one sale with 59 views. If anyone has any insight on this topic, I'll be interested to hear. Now for Color! These pictures are from yesterday's hike. With the leaves mostly fallen, I was forced to look more closely for the gem-like details. 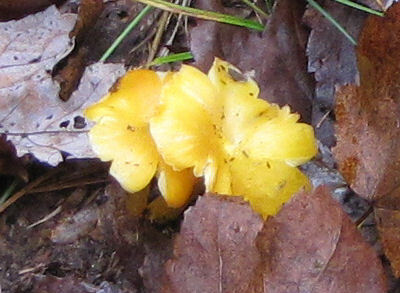 These little yellow mushrooms were split, and looked almost like flowers. I tried to ID them, but couldn't find a good match in my books, and I don't know enough about mushrooms in general to take me any farther. I got a picture, and then one of the dogs stepped on them! In the midst of all the surrounding brown, one lone orange sprig of oak was curled toward the sun. 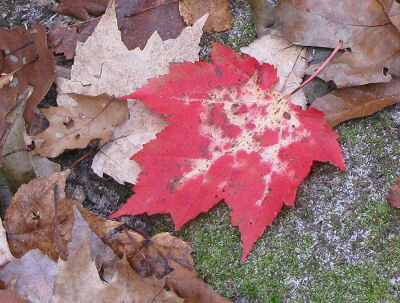 The red maple leaves seem to hold their color just a little bit longer. It was hard to pick just one to share, but I like how this one landed near some green moss. Finally, I just have to share this one. 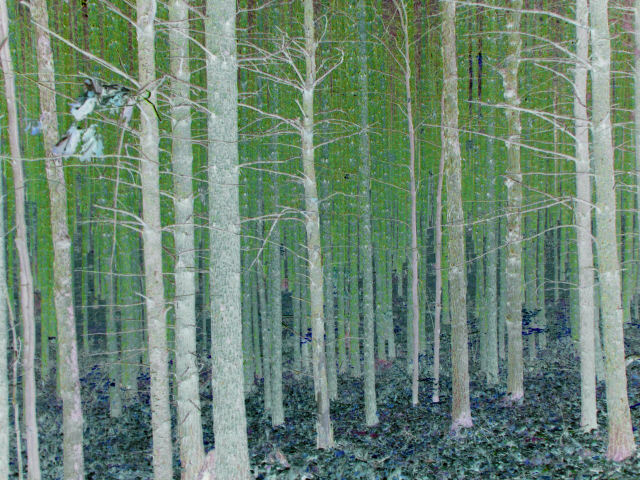 Our hike overlapped with the one I did just a few days ago, Walking at Ward Hills, and this is the same small pine plantation that I mentioned photographing so often. No sun yesterday, but I think maybe I like this picture the best of all. I liked it so much that I decided to play with it. You can click this one to make it bigger if you want. Eight people and four dogs headed north from Timber Creek Trailhead on the North Country Trail. As you can see, most of the colors are gone from the trees. Lots of brown crunchiness underneath, though! After some indecision about plans (should we carpool to the next road and walk back?) we decided to just walk out and back. 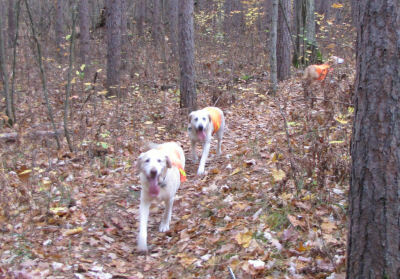 The dogs were all decked out in orange because it is small game season, and archery deer season. 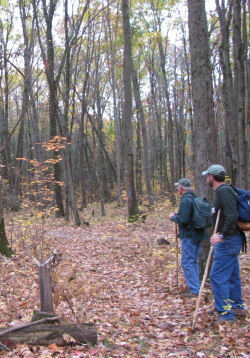 Most hikers don't have any qualms about sharing the woods with these kinds of hunters. They look at what they are aiming at. In fact, we interacted with a group of guys from North Carolina who had four springer spaniels with them. It was quite a doggy few moments! We hiked about five miles all together. But my luck on timing ran out. It started to rain with about a mile yet to get back to the trailhead. 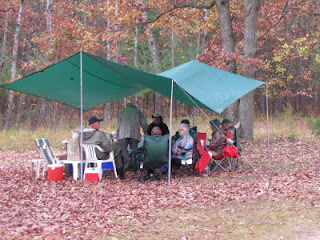 When we got there, the guys put up a tarp, hauled out some chairs (this was all pre-planned), and made us a dry space. Does this sound a lot like our September meeting in the rain? Well, at least it wasn't raining THAT hard! 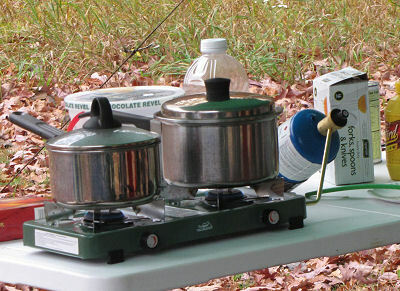 It wasn't long until some hot dogs and beans were heating on the camp stove. 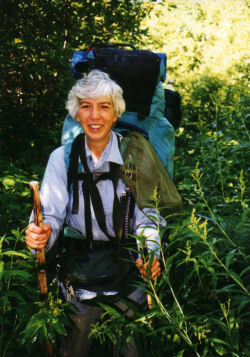 We enjoyed a hot lunch, looked at pictures from one of the couple's trip to the Boundary Waters in Minnesota, and even chatted with the hunters some more. I did get a few colorful pictures, but I'll save those for tomorrow. It's been a while since I've brought you any new words. I LIKE new words, so I'm about to correct that error. In fact, I'm going to try to make it a monthly feature... or at least whenever I learn 4-5 new words. Personally, I think every book should have at least one word in it that I have to look up. This isn't the monthly contest, and this isn't going to have the number of choices as I've sometimes made up. But it's just for fun. The answers are farther down in this post. 1. To deliquese is to liquefy. I learned it in relation to the self-digesting mushroom. Inky caps deliquese. 2. Vigara is something to do with mist and lightning. I can't find the word anywhere, and of course, the internet insists that you want to look up Viagra. It's in a Tony Hillerman novel, The Sinister Pig, in the following sentence, "No lightning yet, and only one of the clouds was dragging a mist of vigara below it." Because of Hillerman's settings, I'm assuming that it has to do with a Navajo belief. 3. 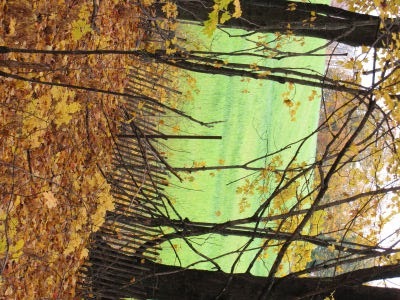 Giclee is a high-quality inkjet printing technique for art prints. 4. Jish means all three of those things. I ran across it in a Hillerman book, with the use of a Navajo medicine bag. The Urban Dictionary provided the other definitions. Tomorrow, I'll be back in the woods with the trail club! About the only news here today was a slow-moving front that kept the day mostly gray, chilly, and damp. Here's the view from the top of a hill about 11 am. By 5 pm, the front had moved on to the east, and you can see how the sky in the same location has changed. Finally, much to my surprise, the afternoon sun lit up the trees beyond the railroad tracks. Without the slanted light, those same trees don't appear to have much color left. Follow the link below to see these trees in morning light. Today, I had a meeting to go to about 30 miles from home. There's a trail near there called Sheep Ranch Pathway. (I've never researched it, but I'm guessing it might have been a former sheep ranch, ya' think?) So, I got to eat pizza and Maggie got to wait in the car for 3 hours. But finally we headed to the woods. 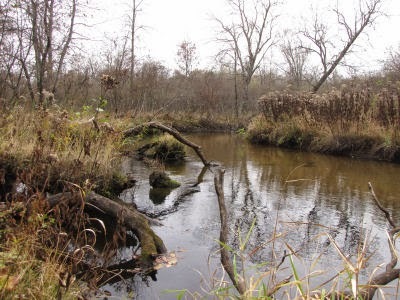 It's an area of varied forest, wetlands, and small lakes. If you hike it all, it's 4.5 miles- long enough to feel as if it were worth the trip. 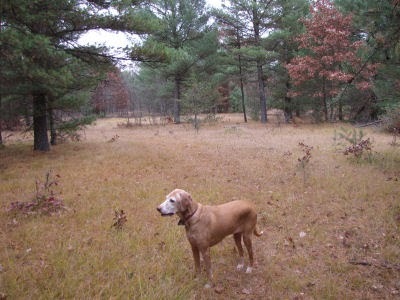 Here's Maggie standing in what is pretty much an oak savannah ecosystem. At the very north end of the trail system, you can access the Baldwin River. It's a nice place to let a dog get a drink. The colors are pretty much gone. Another frost last night loosened even more of the leaves from the trees. 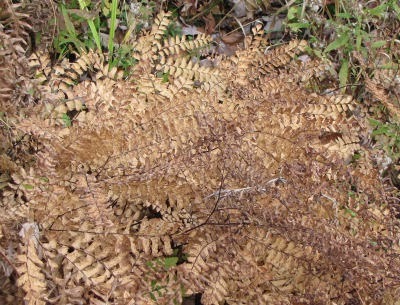 But even in brown, the northern maidenhair fern has an intricate beauty. 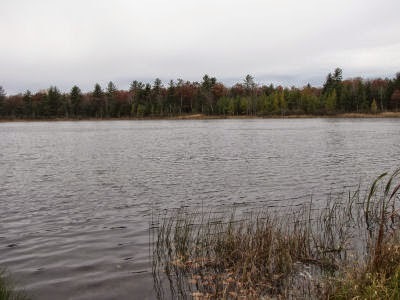 There are two small State Forest Campgrounds there, on Big and Little Leverentz Lakes. This is the bigger one. Not too picturesque on a gray day, but any day in the woods is better than a day on the couch! Maggie wants you to know that she had a great time. Not only was it a nice walk, but she got to sample deer guts (before I managed to chase her away), and found a donut for dessert. With pink frosting, no less! The good timing? It started to rain just as we got back to the car! It's taken me a few days, but I finally am ready to accept the Versatile Blogger award, given to me by Ivy at Spinning Lovely Days. Versatile is a nice word for "unfocused," "all over the map," etc. But at this point in my life, I embrace my versatility! Thank you, Ivy. Thank and link back to the person who gave you the award. Pass the award to other bloggers who you think deserve it. I'm going to put my four recipients first, and then proceed to the second part of this post, and item #2. 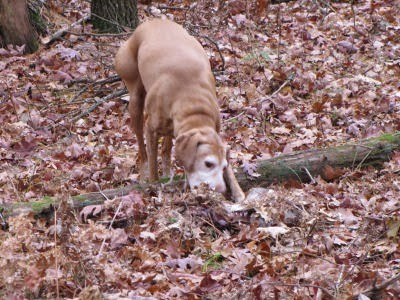 Recipient 1: Dennis the Vizsla, and his dada. Not only are they versatile, but, heck, I would give them an award just to get into the Sunday Awards and Meme Show (if Dennis gets back from his other dimension in time). Recipient 2: Rose, at What I Made Today, because she is truly versatile! She draws, and cans food, and makes mysterious "stuff." Recipient 3: John, who writes Some Assembly Required. He is a photographer, web designer, Dalmatian lover and nurturer, and collector of interesting watches. Recipient 4: Kwattro. I've recently become acquainted with him in the Adgetize forum. He collects a variety of things, and blogs about some of them at A Day in a Zoider's World. With such diverse interests, he must be versatile. 1. I am wearing pajamas with flying cows on them! 3. I am in the #1 spot at Shared Reviews right now! 4. I'm a Jeopardy! Junkie. 5. I not only hate pink, it makes me nervous. 6. I'm bored with thinking up new things about me. But now, as we all will, he has gone on to face the hereafter. The paper gave no indication of what happened. Here's a poem I wrote about him in 1975. Christmas vacation with his Mom. That he needed for a class at school. White flag with a red cross. “Sure you can, “ I said. The flag was finished, ready to hand in. 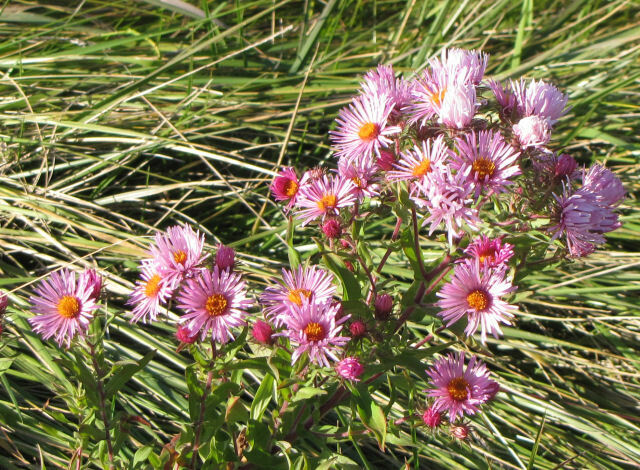 ... in the same field I found one plant with pink blossoms. Not unheard of, but sort of an oddity. 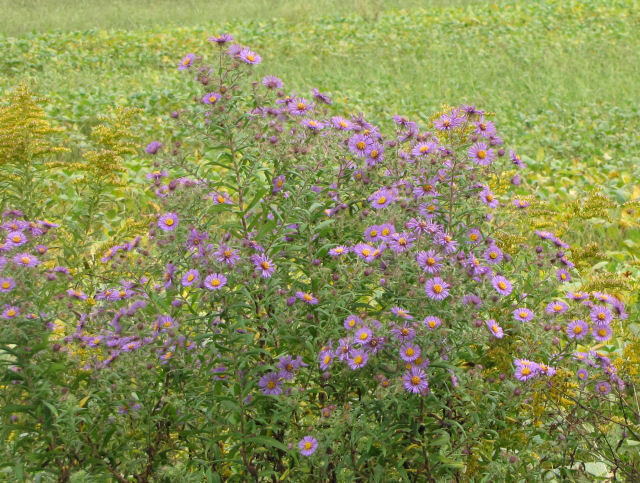 The fast way to be sure it's New England Aster is to look at the leaves. 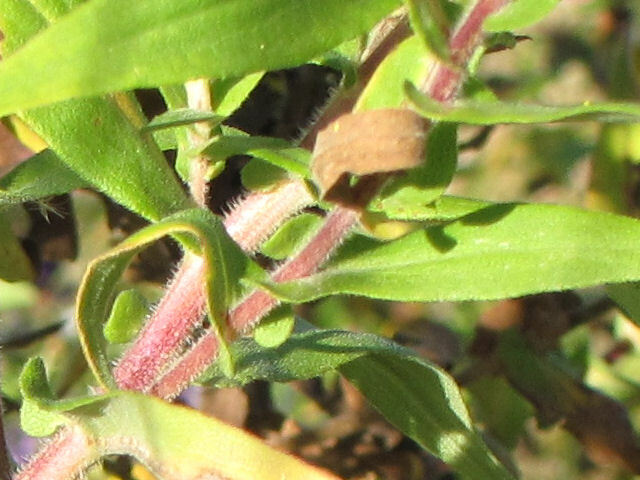 See how they clasp the stem? They almost look like little arms just hanging on for dear life. That's the giveaway. If You Can't Beat It, Eat It!